Break up your pastel portfolio this spring with bold, sunshine prints. From maxis to midis, peplum to pencil; our decorative dresses will give your social calendar an eye-pleasing seeing to. Polka dots are coming in first place as one of the hottest trends for SS18. Work this popular print into Cuban-inspired maxis and ruffled wrap dresses to steer your new-season wardrobe in the right direction. When it comes to spring weddings, there’s nothing better than having sugary-sweet bridesmaids by your side. So if classic colours are out of the question, try something a little sweeter with soft, sherbet shades. When your swimwear looks this good, who needs an excuse to go on holiday? From bardot to plunging necklines, ruffled trims and pretty floral prints, we’ve got everything you need to soak up the summer sun in style. Vertical stripes flatter your frame in an instant; drawing the eye downwards, as well as inwards. Worked into wrap-around maxis for SS18; you’ve got all your occasionwear needs covered with this one simple dress. Jumpsuits aren’t just for summer holidays. With tailored silhouettes now making headlines, use this all-in-one to your occasionwear advantage. Perfect for weddings, christenings, or even formal events; it makes a welcome change to midi dresses. Designed for those looking for an SS18 trend with a bit more bite; it’s time to make way for magenta. Big, bold and beautiful; this season’s palette just got a whole lot feistier. Start your transition into colour with this belted trench coat. Let’s face it. It just wouldn’t be spring without florals. Dark and romantic or sweet and summery; whatever your style, there’s a pretty print to suit you. Perfect for summer weddings, family christenings and even garden parties; you can’t go wrong with this tried-and-tested pattern. When you’re after a smooth finish to your look, the bodysuit is on-hand to give you a sleeker silhouette. Perfect for tucking into high-waisted jeans, skirts and even denim shorts, they’re a year-round essential that can do no wrong. Looking good for less has never been easier thanks to our Outlet store. Take to the dancefloor for less than you thought possible with our fantastic collection of discounted party dresses. Starting from just £8, you’ll be leaving with more than just one. Spring has sprung and the only event on our mind right now is PROM! We’ve teamed up with Jon Richard to create the ultimate go-to guide of 4 ways to style out your prom look for 2019. From princess inspired prom gowns to edgy embellished accessories we’ve got your prom look covered, because let’s face it – your big dance deserves its own personal spin. Put your best foot forward and check out our top prom styles for the season. Show em’ some shoulder in the Chandra blush maxi! Featuring a beautifully embellished sweetheart bandeau neckline, crossover pleat waistband and floor length skirt, the bandeau maxi is perfect for achieving the ultimate in understated elegance this prom season. Style with a barely-there stiletto, box clutch bag and tousled locks for an ultra-feminine statement. A statement, bold braid is our go-to hair style for the belle-of-the-ball bohemian prom girl. The key to achieve the perfect bohemian braid is to add thickness and length to your hair with clip-in hair extensions. 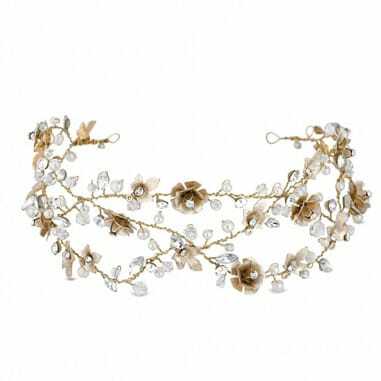 Adorn your boho-chic look with an embellished hair vine, guaranteed to make the most memorable of prom pics. If girly-glam is your signature style, the classic skater prom dress is the one for you! Fun, flirty and oh-so feminine, this is one for the super-cute Prom Princess. Featuring a lace top design and statement skater skirt in a baby pink hue, the Alanis is our classic prom go-to. Style with metallic details and a touch of hair bling and you’ll be all set to take the crown! 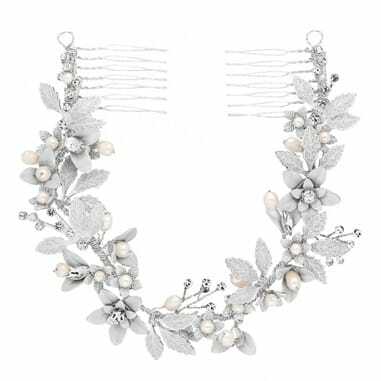 Take the opportunity to shine with a contemporary leaf and pearl double comb hair piece. A half up half down hairstyle is effortlessly chic, yet formal enough for a prom or graduation celebration. Intertwine two French braids for a modern pop of personality to your oh-so-chic prom look this season. Opt for effortless vintage-inspired romance and give a nod to prom days, gone by in the Grece jewel waist maxi. A pleat detailed bodice is strikingly adorned with jewel waist embellishment making for a subtle retro statement. Let your dress do the talking with this one, simply add a touch of subtle sparkle and party like the prom queen, you are! Ramp up the romance with a whimsical halo hair accessory this prom season. Style a refined, romantic low bun with a gold floral hair piece for the ultimate unique vintage touch. This look is sure to make you stand out from the crowd on the prom dancefloor. Add some magic to your prom night and ramp up the glam in full-on sparkle! The Briella Pearl top prom is oh-so-extra and we LOVE it! Featuring hand-embellished with iridescent sequin and scattered faux pearl bodice. This flirty little number promises to have all eyes placed firmly on you when it comes to prom night! If you’re dreaming of being the ultimate prom princess, a fairy-tale bun is a classic prom hairstyle to complement every elegant gown. 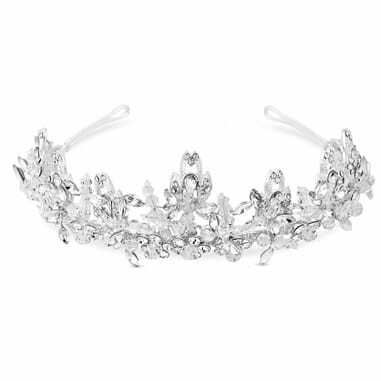 Whether you have short or long hair, the Jon Richard Sophia statement tiara will add elegance and sparkle to your perfectly put-together chignon bun. Frame your face with tousled sections of hair for added texture and volume. 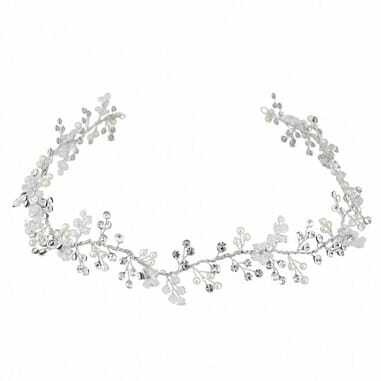 Make your prom night one to remember with our top picks of prom-queen worthy accessories and dresses for 2019. From earrings and necklaces to matching sets, we have everything you’re looking for to make your big night a style success.